If you have visited this blog, or spoken to me at all, you know that Stranger Things holds a special place in my heart. The first trailer came out this past summer, a year prior to the tentative release date. The trailer gave us very little idea of the story itself, but gave us one massive hint as to what the plot will revolve around: a brand new shopping mall! My dad and I are absolutely elated by the news. We are total Ghost Mall junkies, and the thought of a mall that will inevitably turn into The Upside Down? Sign us UP! So, here are my predictions for this mallrat season! Chief Hopper will face the main tragedy. We already have confirmation that Will Byers will get to take a season off from being the center of disaster. My hunch on Hopper facing whatever monster we get comes from parallels in the last two seasons. 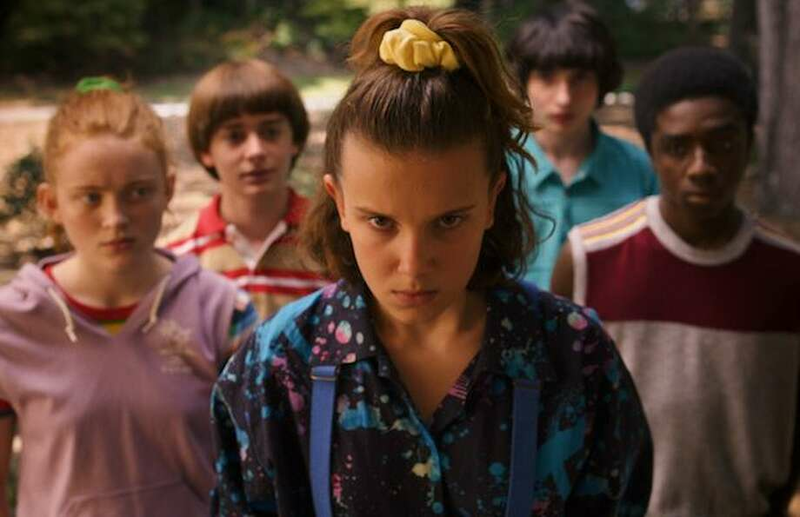 Will is rescued from The Upside Down after Hopper pulls an entire slug-type object from his mouth, and then Will famously coughs up a tentacle in the closing of season 1. In two separate occasions during Season 2, Hopper and Dustin accidentally swallow this same liquid. The liquid that possessed Will is therefore inside the both of them. I think it would make more sense for Hopper to be the focus, as that would bring an entirely new element to the show, and I frankly cannot picture Dustin in the same shoes as Will. We would miss a lot of the comedy and charm that Dusty brings to the show if we throw him into a possession mess or cast him into The Upside Down. Nancy will want to be with Steve again, but Steve is stuck on workplace romance. The only glimpse of the familiar cast in the season 3 trailer is Steve Harrington, depressed as can be, handing over an ice cream cone to the camera. He is accompanied by a new character, played by Maya Hawke. Hawke will play an “alternative girl” that is bored with her day job. From the little glimpse we get of their coworker relationship, they seem to be opposite souls — but that may be just what Steve needs to move on from Nancy. She is a breath of fresh air compared to our favorite Wheeler sibling. It seems like Eleven is slowly able to leave the house again, and Hopper wants nothing more than for her to fit in. I’m hoping this means we get a full on, cheesy, fitting room fashion show scene with beloved Jane. I can already hear her confusedly saying the names of iconic 80s fashion items. Maybe Nancy Wheeler will be kind enough to help her pick out some cute things. A love plot for Will. We already established that Will is getting a break from his consistent torture in this new season. The end of Snowball shows us a casual dane between Will and a girl from school. I’m hoping the Duffer Brothers give Will someone to love on after everything that’s happened to him. I could also see Dustin having a love plot, but Will definitely deserves this the most. What do you think is in store for Hawkins? Let me know in the comments! I’m excited about the new season! I hope the bromance between Steve and Dustin continues. NextParty at Pops Choc Lit Shop!